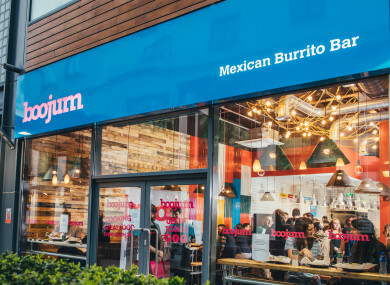 MEXICAN BURRITO BAR Boojum is fighting to retain a takeaway at one of its Dublin locations after the city council received a complaint alleging that the service is being operated in contravention of planning rules. Late last month, the restaurant chain applied for retention permission from Dublin City Council for the takeaway element of an existing restaurant located at units H1 and H5, South Dock House on Hanover Quay in the city’s docklands. The application referenced a condition attached to the 2003 approval of the original mixed-use building which prohibited use of the premises for “take-away sales of hot food”. In response to queries from Fora, Dublin City Council confirmed that it has received a complaint about Boojum operating the takeaway at its Hanover Quay restaurant, alleging that the service is being provided against planning rules, which were first imposed nearly 16 years ago. “The matter is currently under investigation,” a spokeswoman for the council said. Boojum property director Andrew McPhail said the restaurant chain lodged the retention application “having regard to a planning condition in a historic Dublin Docklands Development Authority Certificate that limited take-away sales”. “It is considered that the subject application will put Boojum on an equal footing with all other restaurants in the city, who are allowed ancillary take-away sales as an inherent part of a ‘restaurant’ planning permission,” McPhail told Fora through a statement. Boojum’s application to the city authority was prepared by town planning consultancy Thornton O’Connor, which said it was of the opinion that the 2003 rule that prohibited the sale of takeaway food was intended “to stop the use of the premises as a takeaway unit which relates to 100% of sales and consumption off the premises”. “Since it has commenced operations in Hanover Quay, Boojum’s in-restaurant take-away sales amount to 3% of the total number of sales,” it stated, adding that the location provides seating and toilet facilities, unlike a traditional takeaway like a chip shop. The town planners also noted that Boojum doesn’t use deep fat fryers typical of fast-food joints and said it was of the opinion the Hanover Quay location “is a restaurant and not a take-away and as such, there is a very strong argument that (the 2003 planning condition) is not relevant to Boojum”. The chain said that if it is given permission to keep selling food to-go, it will put the restaurant on equal footing with an estimated 53 restaurants within a 1km radius of the branch that offer takeaway facilities or services like Deliveroo. Belfast-founded Boojum has expanded rapidly across the island of Ireland in recent years. Newly filed accounts for Modern Restaurant Concepts Ltd, the holding company behind the group that operates Boojum, show that the outfit delivered a loss of £647,300 for the year ended 23 April 2018, down on the £151,400 profit recorded 12 months prior. The burrito bar chain, which attributed the loss to its growth programme, recorded annual sales of £18.4 million, an increase of £6.3 million year-on-year. Some £11.9 million was generated in the Republic of Ireland alone. Boojum has 18 locations on the island of Ireland and is majority-owned by Dublin investment group Renatus Capital Partners. Email “Burrito bar Boojum is fighting to keep a takeaway at one of its Dublin joints”. Feedback on “Burrito bar Boojum is fighting to keep a takeaway at one of its Dublin joints”.